How will Lidl repeat the marketing success of ”Restaurant Dill”? Now the question has an answer: A live pop-up alternative Nobel party for 1300 guests with Masterchefs and all revenues to cancer research. “This will be something of an ordeal,” says marketing manager Caroline Forsshéll. Dill is Swedish Lidl’s awarded marketing concept which only subsequently revealed that the food and the concept of a pop-up restaurant called Dill (with a Lidl reversed logo) was entirely Lidl works. “Dill lasted three weeks and sold out in 19 minutes. LE BON is only for one night, “says Caroline Forsshéll, communications manager at Lidl. The banquet will be held at Annexet at the Globe Arena, but in a completely new setting. Tickets to the pop up banquet December 10, the same night as the Nobel party, are released on 2 December. Anyone will be able to reserve tables to “eat one of the finest menus to the world’s finest price, SEK 395,” where all the revenues go to the Children’s Cancer Fund. Caroline Forsshéll expects the table seats to sellout fast. With the pop-up banquet Lidl wants to demonstrate that their raw materials can cook amazing food that can be bid on at the festive context. 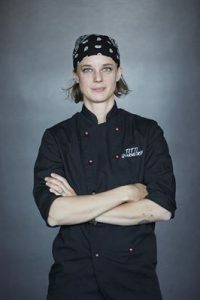 Star chef Titti Qvarnström, from Bloom in the Park in Malmö, will lead the work in the kitchen. 50 other passionate chefs will assist her. At the time 19:33, a procession of 260 waiters will march down the specially-built stairs to serve the 1 300 guests. “The menu will be a surprise, so I can not reveal it. What I can say is that the food will be cooked entirely on Lidl quality merchandise and much is Swedish, ” says Titti Qvarnström. The name LE BON means “good” in French. The good, as in the good food, but will also symbolize that revenues for the food goes to a good cause, to finance Barncancerfonden vital research. Lidl supports since 2010 Barncancerfonden business and is since 2012 one of their main partners. “We do LE BON-banquet to show that our food is so good, it is excellent to use when you invite family, friends and relatives to dinner at parties and celebrations. This will be something of an ordeal, but we are confident that our raw materials quality, “continues Caroline Forsshéll.